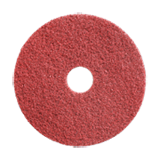 12 inch HTC Twister floor cleaning and polishing scrub pads made with billions of microscopic diamonds will transform dull, worn floors into bright, clean floors without chemicals. Revolutionary Twister™ Diamond Pad cleaning system consisting of pads in various grades that clean and polish the floor mechanically instead of using chemicals. Use Twister HTC pads on floor surfaces including terrazzo, ceramic tile, linoleum, vinyl, natural stone and concrete. Twister™ has specific maintenance instructions to meet different flooring needs. Follow these directions for Rubber, LVT, VCT.